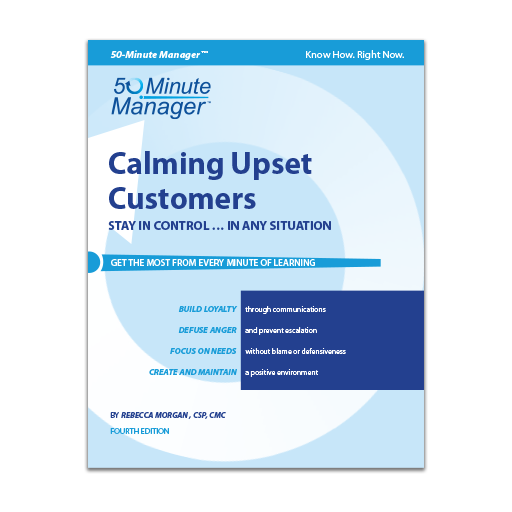 The 50-Minute Manager Series was designed to cover critical business and professional development topics in the shortest time possible. Our easy-to-read, easy-to-understand format can be used for self-study or classroom training, or even office training. With a wealth of hands-on exercises, the 50-Minute books keep you engaged and help you retain critical skills. When a customer is upset with your company, you are presented with the ulitmate opportunity. You can “become the company,” defuse the situation, win the customer over, and ensure continued business. There is no single technique for every customer, but the collection of skills outlined in this self-paced book will work in any industry.